That is a beautiful motorcycle,” said my comely young neighbor as she pushed her baby’s pram by my house as she admired the 2017 Harley-Davidson Wide Glide in Velocity Red Sunglo with Faded Flames paint. Random unsolicited compliments such as that constitute half of the experience of owning a motorcycle as striking as the Wide Glide. The other half, of course, is the enjoyment of riding the relaxed big-inch cruiser with the skinny front tire. While I can admit that I tend toward fat front tires on cruisers, as I like the settled feel of plenty of rubber on the road, the Harley-Davidson Wide Glide enjoys light steering that has its own appeal. The Harley-Davidson Dyna family alternates between 16- and 19-inch front wheels, with the Wide Glide as the sole 21-incher in the bunch. It just so happens that the Wide Glide also has the widest rear tire in the Dyna line, a 180 (along with the Fat Bob), so the Wide Glide is an outlier among Dynas. Of course, the Wide Glide doesn’t derive its name from the rear tire. 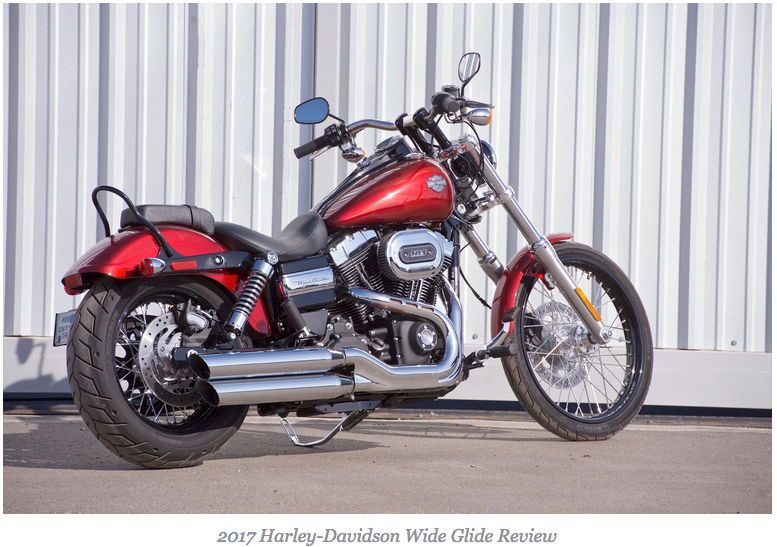 Instead, the FXDWG Wide Glide—which has been around since 1993 and is a descendant of the 1971 FX Super Glide—gets its moniker from the widely set fork legs. When you see a Wide Glide coming down the road toward you with the beefy 49mm fork legs set far apart, with just an 80mm front tire and thin fender between them, it is instantly recognizable. The Wide Glide also has its own ride. 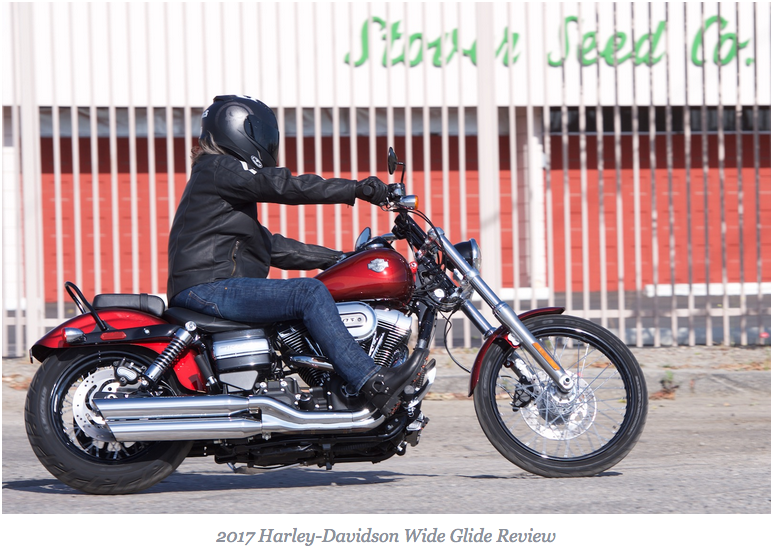 The 35-degree fork angle (34 degrees of rake), 67.5-inch wheelbase, and the 21-inch laced front wheel tell you one thing—the Wide Glide wants to go straight. No doubt about it, the Wide Glide is superb in town or on the open road heading in a singular direction. Having said that, I couldn’t resist taking the 2017 Harley-Davidson Wide Glide for a few runs into the local canyons, including an extended high-speed ride through Angeles National Forest. After all, it does have the fantastic High Output Twin Cam 103 powerplant. Although stability is not its strong point when doing any sort of cornering, it feels good enough to not avoid a bit of fun in the twisties. 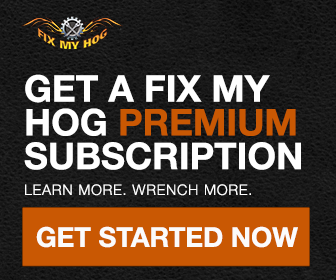 The Michelin Scorcher 31 rear tire doesn’t have much demand put on it, but the front black donut has quite a bit of responsibility. It has to guide the Wide Glide through the corners, even when the chassis, 180 rear tire, and rubber-mounted engine are resisting. I quickly learned to set the Wide Glide into the turn and hold my line. When I did that, it cooperated with only the early dragging of my boot heels into the pavement slowing things down. I do like that soft warning, rather than scraping pegs or pipes. Urban riding is a blast. The big V-twin is a manageable brute around town, allowing for serious acceleration when the stop light turns green. You’re moving in a straight line, and all is good. In these city settings, the narrow front wheel has a light touch, reducing fatigue when guiding the nearly 700-pound machine between cars and down crowded streets. The Wide Glide is generally happy to go where you point it, drama-free. Suspension is a bit of a happy surprise. The hard ride you expect from the fork angle and low profile front tire is offset by five inches of travel and non-flexing tubes. The three inches in the rear isn’t bad, even though they aren’t the emulsion units we love on other Harley-Davidsons.